Iberis or Candytuft consists of about 50 species of annuals, perennials and evergreen sub shrubs. The plant does not grow in shade or overly damp soil. 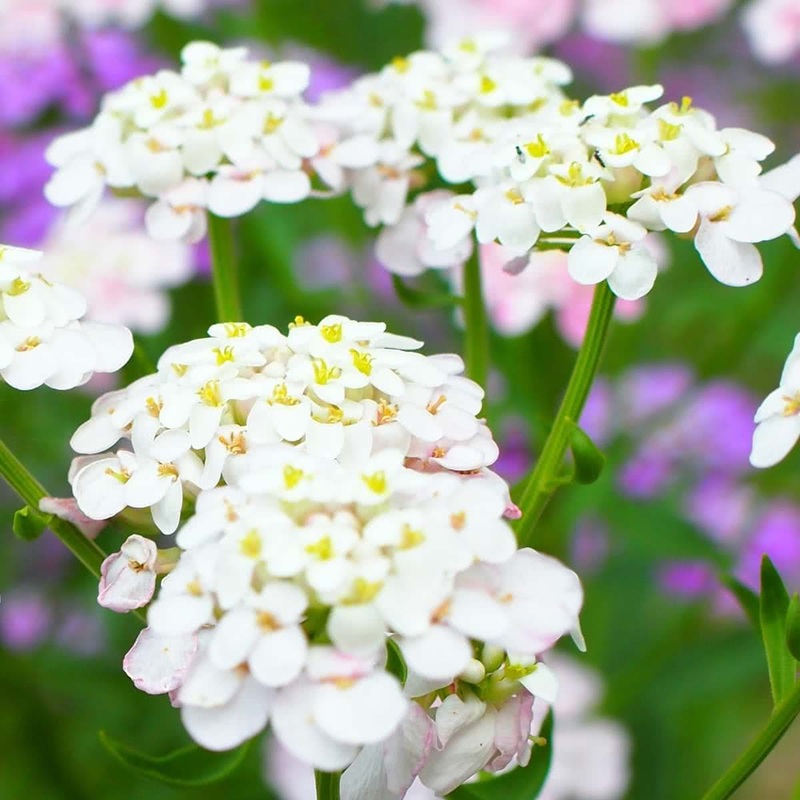 Introduction and Uses:Candytuft is an erect plant that bears 15 cm long spikes of white flowers which resemble hyacinth. It is used as a cut flower, mass growing in flower beds, in annual borders, and edging along paths. Candytuft is also suitable for growing in pots. Candytufts are grown by transplantation method. In India, seeds are sown from August to November for winter flowering. Seeds are sown thinly in nursery beds/ seed pans/seedling trays. Before sowing the seeds, soil/coco peat should be made slightly moist. Immediately after sowing the seeds, watering should be done carefully with a watering can. Seedlings are allowed to grow on seedbeds/trays kept in semi-shade. After about a month, seedlings are transplanted in pots or flower beds. Seedlings should be transplanted in high-quality rich soil or potting mixture. The seeds may be sown directly in permanent sites in November-December. For obtaining continuous blooms, sowing may be done at fortnightly intervals. Planting Distance: 15-25 cm apart. Plants can be grown in 20 cm pot. Watering: Daily light watering is needed for first few weeks of seedling growth and potted plants. Outdoor beds can be watered once a week by flood irrigation. Feeding: Fresh compost should be added to soil at the time of planting. Liquid cow dung manure is given every 15 days along with vermicompost. Plant care: Spray fungicides on young seedlings to avoid ‘damping off.' Click here to buy plant care products online in India. Bloom time: The plant flowers in 3 months after seed sowing. Buy variety of flower seeds online.